Holland Island was originally settled in the 1600s, taking its name from early colonist Daniel Holland, the original purchaser of the property from the Dorchester County Sheriff. By 1850, the first community of fishing and farming families developed on the island. 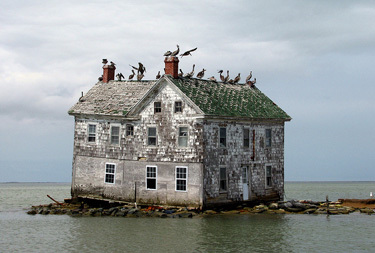 By 1910, the island had about 360 residents, making it one of the largest inhabited islands in the Chesapeake Bay. The island community had 70 homes, stores and other buildings. It had its own post office, two-room school with two teachers, a church, baseball team, community center, and a doctor. The islanders supported themselves mainly by dredging for oysters, fishing for shad and crabbing. Their fleet of workboats included 41 skipjacks, 10 schooners and 36 bugeyes, some of which were built on the island. In October 2010, the last remaining house on Holland Island, built in 1888, collapsed. The land of the island has been subsiding as a result of post-glacial rebound, the return to normal of bulges created by the weight of glaciers elsewhere during the last ice age. This process has caused a major loss of land on the island. Like other Chesapeake Bay islands, Holland Island is primarily made up of clay and silt, not rock. The western ridge of the island is very exposed to waves in the bay, making it prone to erosion as well. The island’s size has been reduced by half, from 160 acres (0.65 km2) in 1915 to 80 acres (0.32 km2) in 2005. Most of the remaining land on the island is now marsh, and at high tide the island is underwater.